As you might already know, British Columbia embodies exquisite extremes of urban beauty and wilderness paradise. 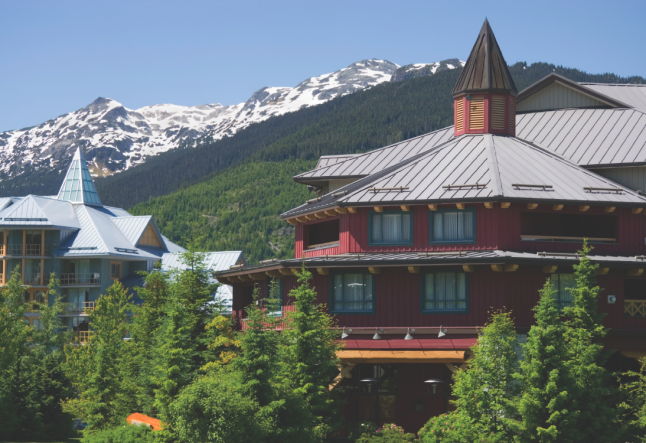 Along with Vancouver’s urban delights and wonderful waterfront, there are Whistler’s old-growth forests, super-long ski seasons and radiantly lovely summers. No wonder the region attracts legions of spa-goers, mountain bikers, skiers, snowboarders, yogis and foodies. Vancouver and Whistler are changing at warp speed. This formerly low-key resort village has morphed into a more upscale scene. There are several new hotels in town, including Adara, a groovy boutique ski lodge. Numerous high-end stores are moving in as well. 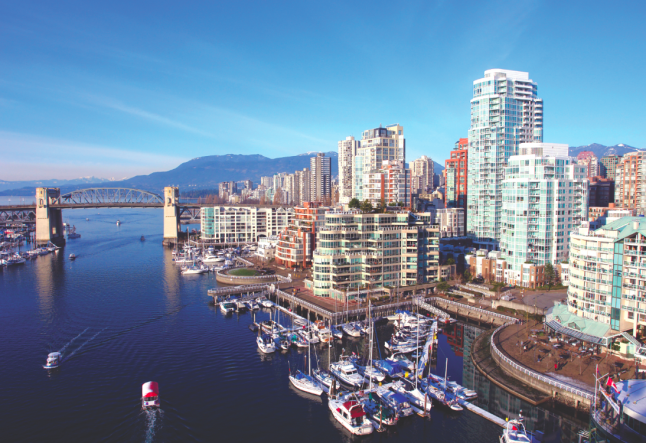 As the gateway city to the 2010 Olympics, Vancouver has also experienced a mini building boom. In a city filled with sailors, skiers and mountain bikers, it’s hardly surprising that Vancouver is also a yogi’s paradise. They have to unwind somehow from all those outdoor sports, and Studeo 55 is the place they go. Professionals, mothers, overweight corporate types and hipsters whom this writer affectionately terms “nose ring people” all practice yoga here in a room abloom with dozens of green plants. Like the yoga scene, Vancouver’s spa culture is highly diverse. For superb facials, massages and other treatments, head to Skoah. What the word means, I have no idea, but the Facialicious facial treatment feels like a purifying miracle for the face, shoulders and neck. For a classic steam bath where you can cleanse and relax as women have been doing in hammams for centuries, glide over to Miraj Hammam. Try the Hammam Gomage body scrub and wash after a long day of walking. It’s also ideal for jet lag recovery. Phresh Spa and Wellness Club in the Sandman Suites Hotel is a must-visit. This women-owned facility features public and private yoga classes and various organic products and treatments. The organic Eminence Paprika Facial is a warming, cleansing winner. Also try the Symphonic European Hydrotherapy or Ayurvedic Oil Massage, which incorporates fragrant herbs and spices. For stylish lodging, make your way to OPUS. This mod hotel with the grooviest décor this side of an Austin Powers flick features comfortable rooms furnished with international retro touches. While the lobby bar is an enchanting place to hang, the hotel’s restaurant Elixir serves superb French bistro fare, superb oysters from surrounding waters and extremely fresh produce. If you deeply love seafood and fish, visit Blue Water. Boasting the most varied, inventive and refined menu of seafood and fish this writer has tasted in the Northern Hemisphere, Blue Water is best experienced earlier in the evening before the room fills up and the noise level rises. When it’s time to head north to the mountains, save money and fuel emissions by traveling via Perimeter’s Whistler Express. The two-hour ride skirts lovely coastline and massive mountains; emerald forests tower on one side and sea waters flow a lovely shade of jade green due to volcanic mineral residue. Hanging out on Whistler’s Blackcomb Mountain during the warmer months is a total blast. A mountain biker’s mecca, there are trails here for all levels of biking and hiking. The first chairlift at the Upper Village sits at the base of Blackcomb Mountain, near Merlin’s Pub. Enjoy hiking around on the top of the mountain, where snow walls still stand through the summer and people go snowboarding on the glacier in July. When you come down from the mountain, practice at Neoalpine Yoga. Hatha yoga, meditation, pranayama, yin/yang vinyasa, sound healing and other classes are given here in a sunlight-filled room overlooking glorious green trees. Neoalpine’s lounge with showers is a much-appreciated amenity. Another fine Whistler yoga studio is Solarice, which has two locations in Whistler Village and offers superb sports massages and various spa services. With multiple spas in a tiny village, you must choose carefully. For authentic Indonesian spa treatments in hushed surroundings, the Taman Sari Heritage Spa delivers exotic rejuvenation. The Artesia Spa at the Hilton Whistler Resort and Spa offers a clarifying and moisturizing British Columbian seaweed wrap. Get this one after a long day of skiing, boarding or blissing out; it leaves skin feeling like silk and might be one of the best ways to prepare for leaving this wonderful mountain village—or a major reason for coming back! Following is a guide to some of the best addresses in Vancouver and Whistler. You might want to visit them before the essential beauty and tone of these places is forever altered by Olympic hurly-burly.